Virginia Governor Ralph Northam has defied calls from fellow Democrats to resign after news broke that he wore blackface in the past. Lieutenant Governor Justin Fairfax is facing similar calls to resign after two women accused him of sexual assault. Attorney General Mark Herring has admitted to wearing blackface as well, but has so far avoided the same kind of pushback from his own party. We hear an update on the crisis in Virginia politics. DAN REEDYou're tuned in to the Kojo Nnamdi show. I'm Dan Reed sitting in for Kojo Nnamdi. This hour we're looking at one of the education issues in our region that you told us you care about, the redistricting of school boundaries in Arlington County. DAN REEDBut first at the end of last week another woman came forward with sexual assault allegations against Virginia Lieutenant Governor Justin Fairfax. Fairfax is rejecting calls to step down as is Governor Ralph Northam. And Democrats so far have avoided calling for Attorney General Mark Herring's resignation in light of his own blackface scandal. We check in on the latest with Jenna Portnoy, regional politics reporter for the Washington Post. Hi Jenna. Is she there? PORTNOYI'm great. How are you doing? REEDI'm all right. Jenna you wrote over the weekend that publicly Democrats have called for Northam's and Fairfax's resignations, but privately they're divided over whether or not the ousting of Northam is best for the party. Why is that? PORTNOYI think the party is in a real quandary at this moment. You know, it was just 11 days ago, when it looked like Northam was going to step down. Since then we've had Fairfax, the lieutenant governor, facing two accusations of sexual assault, the attorney general, Mark Herring coming out saying, he appeared in blackface himself in college. And Democrats have had to figure out what to do when three of their statewide office holders, three out of five, are mired in scandal. So the party officially has called for the resignations of Fairfax and Northam, but there are a lot of diverging points of view within the party itself. 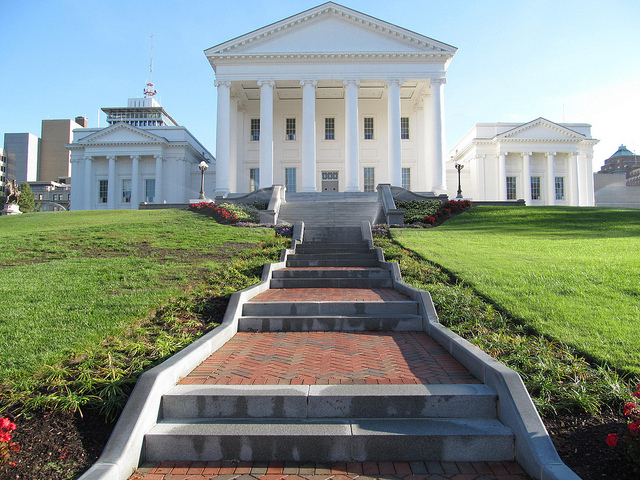 REEDLate last week, delegate Patrick Hope of Arlington said he'd introduce articles of impeachment if Lieutenant Governor Fairfax didn't step down by the end of the weekend. That's no longer happening, why? PORTNOYThat's right this morning, Patrick Hope the delegate from Arlington began tweeting about 6:00 a.m., I believe, saying that he's had discussions and heard a lot of feedback from people since his talk about impeachment. Articles of impeachment first came up on Friday, and he appears to be backing off. He says some investigation should be done, but impeachment -- he's not ready to go forward with that quite yet. PORTNOYI think -- there's a lot of questions about impeachment, because it's unclear within the impeachment section of the Constitution which provision would apply if any to Northam, to Fairfax. In addition to the impeachment section there's a second section that allows for an official to be taken out of office if mentally or physically unfit, but that doesn't appear to fit either. So there's no immediate since of what's going to happen there. REEDIt seems that Attorney General Mark Herring has avoided some of the same calls for resignation that Northam and Fairfax are facing, why do you think that is? PORTNOYThat's right. The attorney general, who just a couple months ago announced that he is going to run for governor, after sitting it out last time he had a chance. He got out in front of his scandal and came forward himself. This was on Wednesday. He put out a lengthy statement, took responsibility for what he did in college and for many people struck the appropriate tone. PORTNOYWhereas Northam had an awkward press conference when this all started. He initially said he would step down -- or initially -- excuse me -- looked like he would step down after taking responsibility for the photo on his yearbook page. And then the very next day saying that he was going to stay put. PORTNOYThere's a real difference in a lot of Democrats minds as to how Herring handled his situation and no prominent voices have called for him to step down. And he appears to be getting something of a -- not a pass, but he's facing much less pressure than the other two. REEDI think the question on a lot of people's minds right now is what if in theory either Northam or Fairfax or even Attorney General Herring were to step down, what would the next steps be? You know, the Post produced this fascinating flowchart of all the different possibilities. PORTNOYThat's right my colleague Philip Bump, produced a very detailed flowchart of what could happen in all these different possibilities. I think -- the important thing to remember here is that it's an unprecedented situation. None of these officials in the history of Virginia have ever faced, you know, impeachment or had to be replaced before the end of their term, back to Reconstruction. So it's pretty clear, as far as the Constitution is concerned, that if Northam steps down Fairfax would be next, the lieutenant governor, and then after that the Attorney General Mark Herring, after that the House Speaker Kirk Cox, who is a Republican. PORTNOYAfter that it gets much more murky. There are conflicting interpretations all over the place about what would happen if Fairfax stepped down. It looks like the courts would probably get involved at some stage. Democrats, you know, for obvious reasons are trying to avoid any situation where the speaker of the House or Republican controlled House and Senate chambers would get to choose any of these positions. Democrats have won every statewide election in the state since 2009 and sort have seen themselves as something on a roll since President Trump was elected. So this puts, you know, a monkey in the works for them, right, to say the least. REEDAll right. Well, thank you so much Jenna. We'll have more on that tomorrow.